The Landscape Australia Expo recently invited Richard Bellemo to speak at their inaugural 2011 Designer’s Breakfast. Held at the Melbourne Exhibition Centre on 1st of September, the two hour breakfast event was established as a private networking function and seminar for landscape designers and architects to meet together and learn from fellow innovators in their industry. Richard was asked to deliver a 15 minute presentation and panel discussion in conjunction with Phillip Johnson from Philip Johnson Landscapes on the theme ‘Going beyond the visual and contributing to ecological systems’– a topic close to Richard’s heart and reflective of the increasing awareness of sustainable landscape principles in the design community. “It is important for our industry to remain connected and this new breakfast event was a great opportunity to network and learn from our industry peers,” said Richard. Joining Richard Bellemo and Philip Johnson on the breakfast panel were Sidonie Carpenter, President of GreenRoofs Australasia who highlighted further innovations in green roof designs and sustainable futures, Ralf Pfleifderer from Urban Design Landscapes Branch of the City of Melbourne on the topic of water sensitive urban design, and Deborah Kuh on re-investing in the public realm. 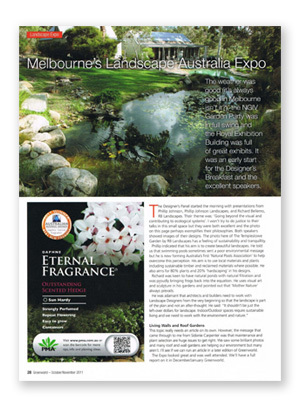 Held exclusively in Melbourne once every two years, the Landscape Australia Expo is open only to trade members and offers the latest in new products, services and technologies from 90 different exhibitors. The industry reputation of Richard Bellemo Landscapes continues to gather momentum with the peak body Australian Landscaping Industry Australia (ALIA) awarding the Templestowe Project with top honors in the best Residential Landscape Construction - $75,000 - $150,000 category for 2011. This national award is further icing on the cake for Richard with his Melbourne based company already taking out the Victorian Landscape of the Year award in late 2010 for their commanding Deepdene Project. Richard’s contribution to the Designer’s Breakfast was well received with local media groups looking to follow closely the progress of Richard Bellemo Landscapes as a contemporary design company with a strong commitment to ecological and sustainable practices.